[Via AP]: A rare soft-shell turtle thought to be on the brink of extinction has been discovered in Cambodia in a former stronghold of the Khmer Rouge, conservationists said Wednesday. A 24-pound female Cantor’s giant turtle – known for its rubbery skin and jaws powerful enough to crush bone – was captured and released by researchers in March, U.S.-based Conservation International and World Wildlife Fund said in a statement. Scientists from the two groups and Cambodian wildlife officials discovered the animal and a nesting ground during a survey in Cambodia’s Mekong River region. “We thought it might be almost gone, but found it in abundance in this one pristine stretch of the Mekong, making the area the world’s most important site for saving this particular species,” David Emmett, a CI wildlife biologist, said in the statement. “This incredible discovery means that a unique turtle can be saved from disappearing from our planet,” he said. The turtle is currently classified as endangered by the World Conservation Union, and continues to face threats from habitat loss and hunting. The species can grow up to 6 feet in length and weigh more than 110 pounds. It was last spotted by scientists in the Cambodian wild in 2003. It also was found in small numbers in Laos, but appears to have disappeared from Vietnam and Thailand. The turtle has a rubbery skin with ribs fused together to form a protective layer over its internal organs. It protects itself from predators by spending 95 percent of its life hidden in sand or mud with only its eyes and nose showing. It also has long claws and can extend its neck with lightning speed to bite with jaws powerful enough to crush bone, the statement said. The statement only said the turtle was found in a former Khmer Rouge stronghold long closed to scientific exploration because of security concerns. The communist Khmer Rouge ruled the country from 1975-1979 and their reign of terror resulted in the deaths of about 1.7 million people. It was the first detailed conservation study of the area since security restrictions were eased in the late 1990s, WWF said. 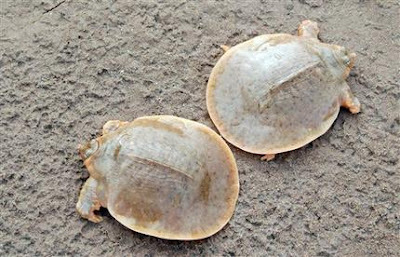 International and Cambodian turtle conservation officials will hire local villagers to protect nesting beaches for the turtles and conduct patrols during the dry season to prevent illegal fishing of the species, which is prized as an expensive delicacy in neighboring Vietnam. The villagers also will receive financial incentives to offset the potential loss of revenue from illegal trade in the turtles, WWF said. [via AP]: The next generation of wireless Internet products certified by the Wi-Fi Alliance is expected to hit shelves this summer, even though a final standard for the technology isn’t due for another year, the industry group says. The Wi-Fi Alliance was announcing Wednesday that it will begin certifying wireless routers, networking cards, microchips and other so-called “Draft N” products in June. The products, which take their name from the upcoming 802.11n technical standard, are expected to reach retail stores shortly thereafter. Wi-Fi comes in several flavors – “b,” “a,” “g,” and soon “n” – referring to the subsection of the technical guidelines issued by the Institute of Electrical and Electronics Engineers, a technical professional organization. The “n” version is expected to be about five times faster than the widely used “g” variety, though in practice, speeds rarely reach what’s listed on the box. Draft N products are said to offer better reach through walls and into dead spots and will use multiple radios to send and receive data, making them better at handling big video files. [Via Alternet] Starbucks, the world’s largest coffee shop chain, and the Ethiopian government are on the verge of unveiling a deal that the company hopes will end attacks on the company’s carefully constructed ethical image. [Via Yahoo]: ‘In an emotional appeal on Tuesday to the World Bank’s board to keep his job, Paul Wolfowitz said a loss of confidence in his leadership would be “grossly unfair” and he called for a fair resolution in a dispute over a pay and promotion deal for his companion. In a last pitch to explain his actions in the agreement he directed for World Bank Middle East expert Shaha Riza, which sparked controversy in the bank, World Bank President Wolfowitz promised to make changes to his management style to regain the trust of bank staff.